Lower back pain is a more common ailment than you may think. However, lumbar spine pain is definitely not just limited to office workers! Or because you work in an environment where you need to sit for extended periods of time. In this article, we recommend some of the best lumbar support cushion & pillows to provide much-needed relief for your pain. Here are our top five picks for low back pillows that can help alleviate pain in the car, while you’re at your desk, or in the car. 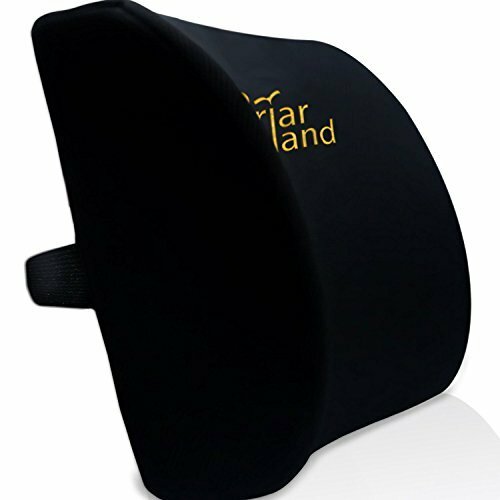 The MedX Lower Back Pain Relief Backrest is a medical-grade support cushion that provides durable support and can easily be attached to any office chair. Equipped with extension straps allowing you to attach it to a chair of any size at the appropriate height for you needs. 100% hassle free guarantee refund policy from the manufacturer. It comes in basic black, making it seamlessly blend in with the decor of any office environment. The memory foam may be too soft for some users. The cushion itself is large, thick & may be the wrong size for more petite users. The MedX chair support cushion is available to buy on Amazon here . 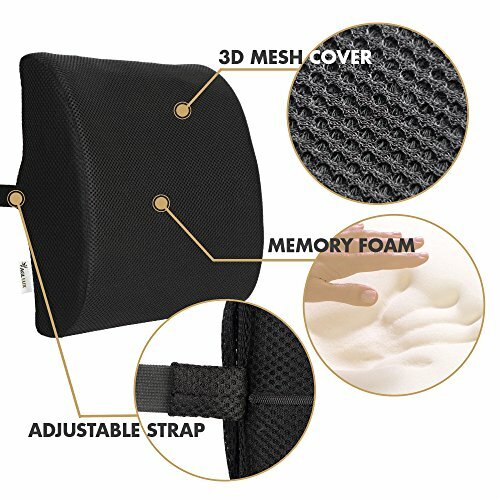 The AGLLUX lumbar support is a portable lumbar support pillow that is made of high resilience memory foam and covered with a mesh outer to keep you cool and comfortable at your desk or anywhere you need additional assistance. Made from good-quality materials. The outer mesh cover wicks moisture away and has a cooling effect. Portable with optional extension strap making it easy to attach and adjust to the right position for you. The extra adjustable strap may not be long enough or some large office chairs, wheelchairs, or vehicle chairs. The AGLLUX Lower Back Lumbar Support Pillow is available to buy on Amazon here . The SOFTaCARE Coccyx and Lumbar Support Pillow provides portable orthopaedic low back and coccyx bone support with memory foam technology. The memory foam is temperature sensitive. If it’s under 70 degrees F, like what you would find in most office environments, the pillow provides firm support. If it’s in a warmer atmosphere, it will soften and mold to your body for a perfect fit. Removable outer cover is machine washable. Big & heavy for plus size users. The bigger dimensions means it may make it too large for smaller users in an office chair. The SOFTaCARE Coccyx and Lumbar Support Pillow is available to buy on Amazon here . The ZIRAKI 5 in 1 cushion is an office or car memory foam lumbar support pillow that incorporates cooling technology into a portable device using a gel cooling pad. Two removable and machine washable covers in black and gray. The gel cooling pad helps to keep your lower back cool when you’re seated for long periods of time, like on a hot car trip. Smaller 13 x 13-inch design may be a better fit for small users. The memory foam in this product is very firm. Some users found it to be harder than expected and uncomfortable. The cushion may not be sufficient in size for larger or taller users. Larger users may find that over time the cushion compresses and loses it shape. The ZIRAKI Memory Foam Cushion is available to buy on Amazon here . The Original McKenzie® Super Roll is designed with the research findings from world-renowned herniated disc pain specialist & physical therapist, Robin McKenzie. The lumbar roll can be use in any backed chair, plus even in bed. This back pillow fits between you and your mattress to provide lumbar support in every sleeping position. Might be too large for smaller users like small females or the elderly. It is recommended to then use the Original McKenzie® SlimLine Lumbar Support instead. The Original McKenzie® Super Roll is available to buy on Amazon here . What is Lumbar Back Support? A lumbar support for the back can be anything that provides a foundation to keep your spine in good alignment and take the pressure away from your joints, muscles, tendons & discs in the lumbar spine. We shared the best back braces for lumbar disc pain here. What Offers the Best Lumbar Support? There are situations where you’re staying still for long periods of time like, whilst driving in the car, working at the office, or if you’re required to stay in bed. A lumbar support cushion can both prevent the development of back pain plus alleviate back pain symptoms to help maintain a healthy spine. Firstly – the lumbar pillow fits comfortably between your spine and your chair to lessen the physical strain on the muscles in the area, reducing the risk for strains or overuse injuries that accompany sitting for extended periods of time. Secondly – the lumbar cushion helps you to maintain good posture, reducing pain in the area and helping to manage existing back pain. If you drive long distances, or experience pain when driving, you’ll want to research the options for good lumbar support for car or truck seats. Even though some car manufacturers offer built-in lumbar adjustment settings within the factory-installed seats for different models; many people find that a removable cushion provides a better back support feeling for an automobile seat. Research shows, workers who sit in a business environment all day are significantly more likely to develop low back pain. Most of us have to sit for long periods in order to get out jobs done. So what can we do about it? There are several options to provide lumbar support for office chairs, and support cushions are a popular choice. In the workplace, the best back support for office chairs will attach quickly and blend in with the environment making you comfortable during the day. Most employers support using lumbar support options at a work station. Some bosses will even pay for a portion of the cost of the pillow as part of an employee benefits package. Human resources should be looking at workplace ergonomics. Back pain pillows that are designed to be used in bed can provide relief and support to anyone who is bedridden or has chronic back pain. Typically, pregnant women & those with a lower back injury commonly use these larger type support pillows to increase comfort and quality of sleep. 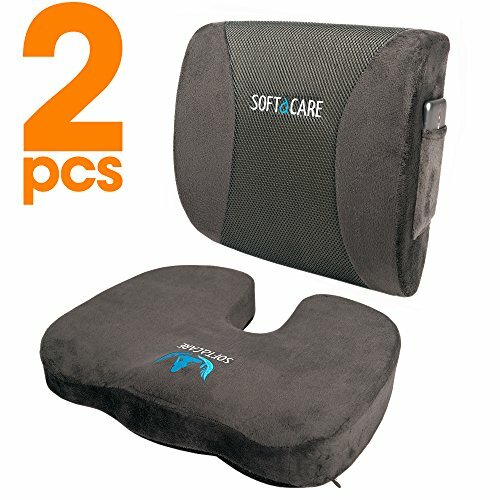 These might be pillows that go into the lower back region when sleeping on your back or pillows that go between the knees when laying on your side. There are five main components that make up a decent support pillow. Here we’ll make note of what to look for in each to help you choose the best one for you. The most important question to answer when searching for appropriate lumbar support is where and how do you plan to use it? A lumbar cushion that you’ll use on your office chair may be different than the one you would use in the car or bed. Some brands offer adjustable bands that wrap around seats of various sizes, while others are designed to be more permanently attached. Decide if you’re shopping for one location or multiple locations to help narrow down your choices. Don’t expect to sink into your lumbar pillow like it’s a fluffy cloud or your comfortable bed. Lumbar pillows are firm to provide support and made with a variety of fillings including memory foam, or extra-firm polyurethane foam. Generally speaking, firmer is better when it comes to low back cushions. Back support cushions can come in a variety of colors, fabrics, and materials to help them blend into your decor, or stand out and make a fashion statement. Where you plan to use your lumbar support pillow may mean you need to make special considerations about its outward appearance. There are several different forms of lumbar support cushions available, and what’s best for you will depend on your preference. Some have a standard pillow shape, while others may resemble a bolster or a wedge. The goal of the pillow is to help you maintain a neutral spinal curve, so be sure to choose one that fits your body shape and type. Know that the form that best supports you in your office chair, for example, may not be the same as what you find most comfortable in your car. A lumbar pillow for car, bed or your office chair may also include some bells and whistles. Some may offer a heat option, while others could have an air-filled component that allows you to adjust the firmness of your support cushion. You’ll pay more for these options, but they are available if they appeal to you. Choosing the right lumbar support cushion to help alleviate your lower back pain can be tricky. To find the perfect fit for you, consider where and when you’ll be using your cushion and shop around for one that has all the qualities that are most important to you. 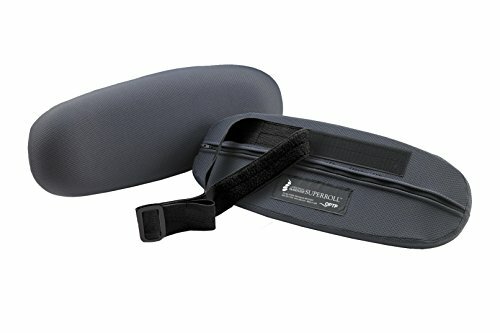 2 What is Lumbar Back Support?